To make a Pumpion Pye. Take about halfe a pound of Pumpion and slice it, a handfull of Tyme, a little Rosemary, Parsley and sweet Marjoram slipped off the stalks, and chop them smal, then take Cinamon, Nutmeg, Pepper, and six Cloves, and beat them; take ten Eggs and beat them; then mix them, and beat them altogether, and put in as much Sugar as you think fit, then fry them like a froiz; after it is fryed, let it stand till it be cold, then fill your Pye, take sliced Apples thinne round wayes, and lay a row of the Froiz, and a layer of Apples with Currans betwixt the layer while your Pye is fitted, and put in a good deal of sweet butter before you close it; when the Pye is baked, take six yolks of Eggs, some white-wine or Verjuyce, & make a Caudle of this, but not too thick; cut up the Lid and put it in, stir them well together whilst the Eggs and Pumpions be not perceived, and so serve it up. A froiz is something that has been fried, usually with beaten eggs like a Spanish omelette. A caudle is a sweetened custard made of egg yolks, cream and sugar or with wine instead of cream; it is poured through the central hole of a pie when it is cooked. 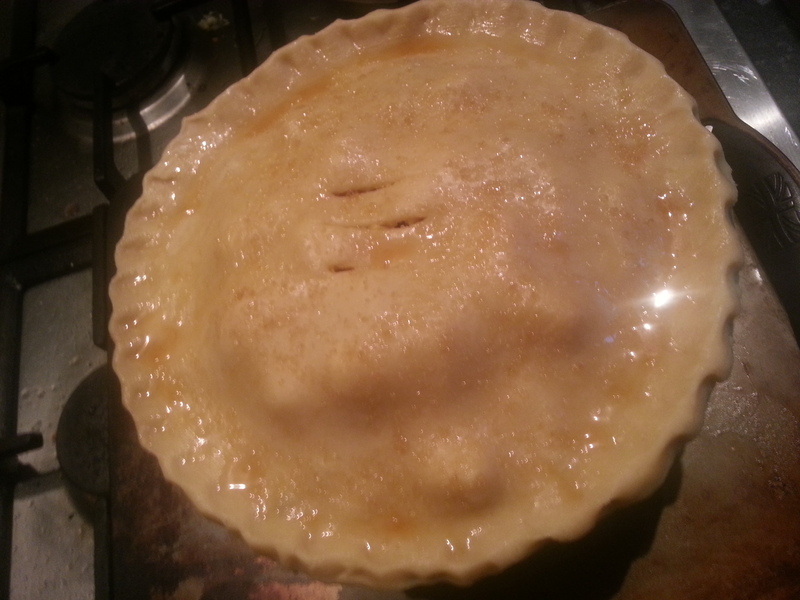 Sometimes, the pie is returned to the oven so that the caudle can set before the pie is sliced. 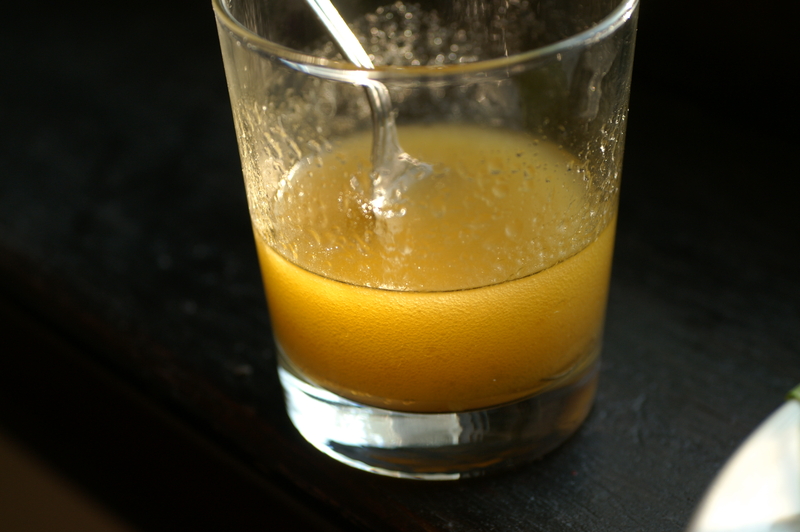 Verjuyce or verjuice is the sour juice of either crab apples or unripe grapes was used extensively in Britain; it serves the same purpose as lemon juice. Here’s a previous post all about it. 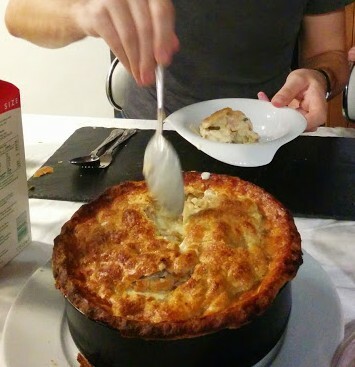 I must admit, it was very worried about making this pie for the diners. I was especially worried about the froiz with all those spices and herbs mixed into the sweetened egg and pumpkin , fried until cooked through then baked. Overcooked eggs release a lot of water and turn somewhat rubbery (as anyone who has overcooked scrambled eggs can tell you). I was not expecting good things. The only thing I changed in the recipe was the caudle – I swapped the wine for cream and made a proper custard to pour into the pie when it came out of the oven. I thought that after six other courses, a wine caudle just might tip folk over the edge. As it turned out, this pie was delicious! The soft apples seemed to prevent the eggs from overcooking (maybe it was the acidic conditions, they provided?) and really set off the tender sweetened pumpkin mixture. The creamy custard helped the whole thing go down very well. Although there might be a few more stages to making this pie, compared to a regular dessert fruit pie, it is well worth the effort, so give it a go. 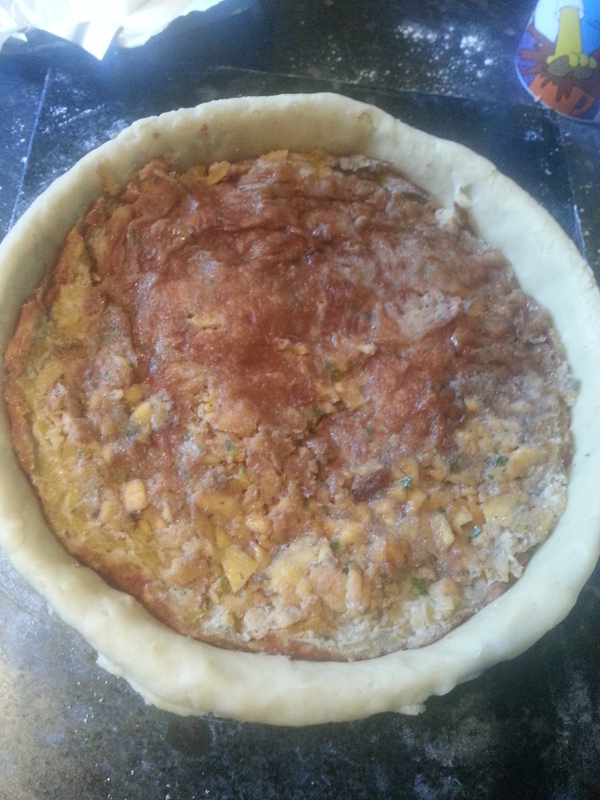 My pie is made in an 8 inch cake tin, so begin by frying the froiz in a non-stick frying pan of a larger diameter. 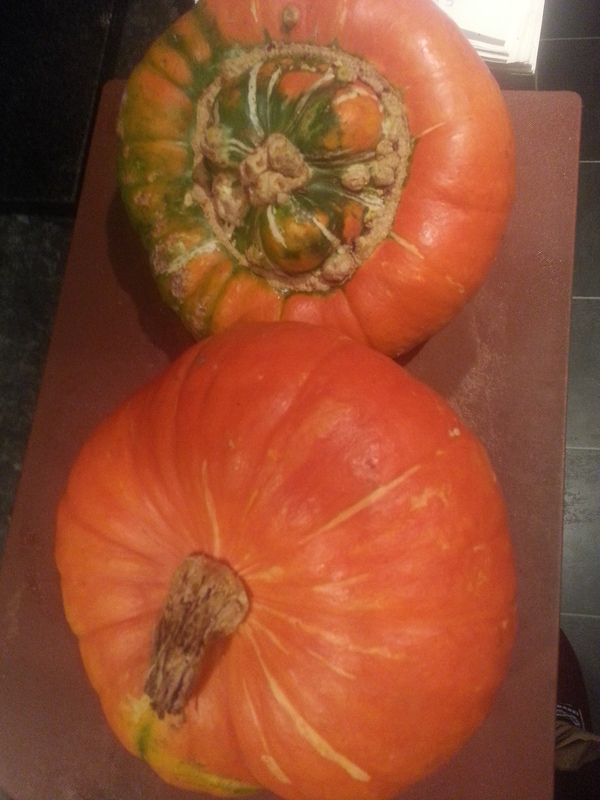 Beat the eggs together with the herbs, spices and caster sugar and stir in the pumpkin slices. Melt 50g of the butter in the frying pan and, when foaming, pour in the egg mixture. Continue to fry over a medium heat, and when the froiz is half-cooked, place under a hot grill until cooked through. Slide the froiz onto a plate and let it cool. 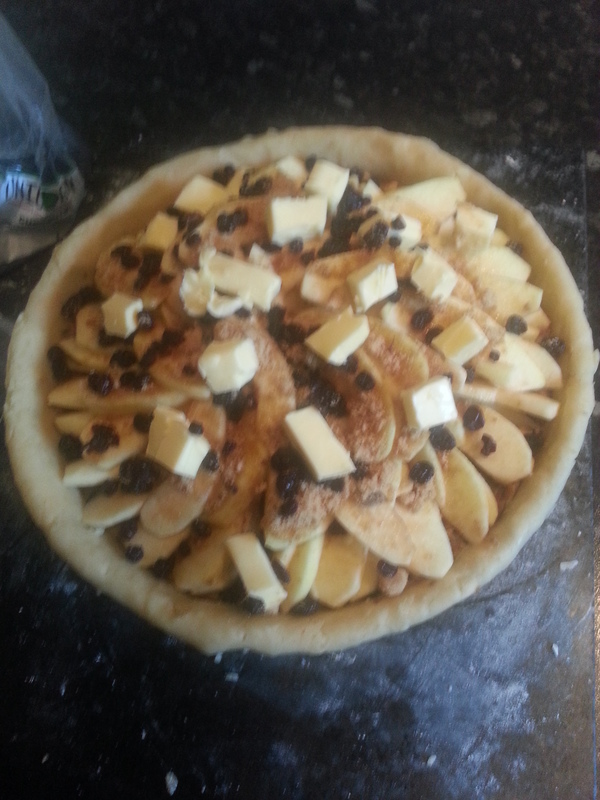 Line an 8 inch cake tin with 2/3 of your pastry, then scatter in half of the apples and currants. If you like, sprinkle on some more sugar if the apples are particularly tart. Trim around the edges of the cooled froiz so that it fits snugly inside the pie before adding a second and final layer of apple and currants. Dot the remainder of the butter on top, before rolling out a lid with the reserved pastry, gluing it in place with egg wash.
Make a hole in the centre and decorate if liked (traditionally, sweet pies are not decorated). Glaze with egg wash and sprinkle on the sugar. Bake at 200⁰C for around 20-25minutes until the pastry has browned, then turn the heat down to 160⁰C and bake for a further 30 minutes or so. Just before the time is up, make the caudle just as you would for a custard tart by heating up the cream and milk, if using, and whisking it into the egg yolks and sugar. Remove the pie from the oven, crack open the top of the pie and pour in the caudle. Return to the oven for about 8 minutes so that it can set. Alternatively, you can heat the caudle mixture in the pan until it thickens slightly and simply pour into the cooked pie. Tagged as baking, caudle, custard, dessert, eggs, fruit, pie, pies, pudding, pumpkin, recipe, The Protectorate, W.M. In my previous post, I gave you a recipe for a basic veal stock, so I thought I would give you another recipe that shows of these kinds of home-made stocks to their best. 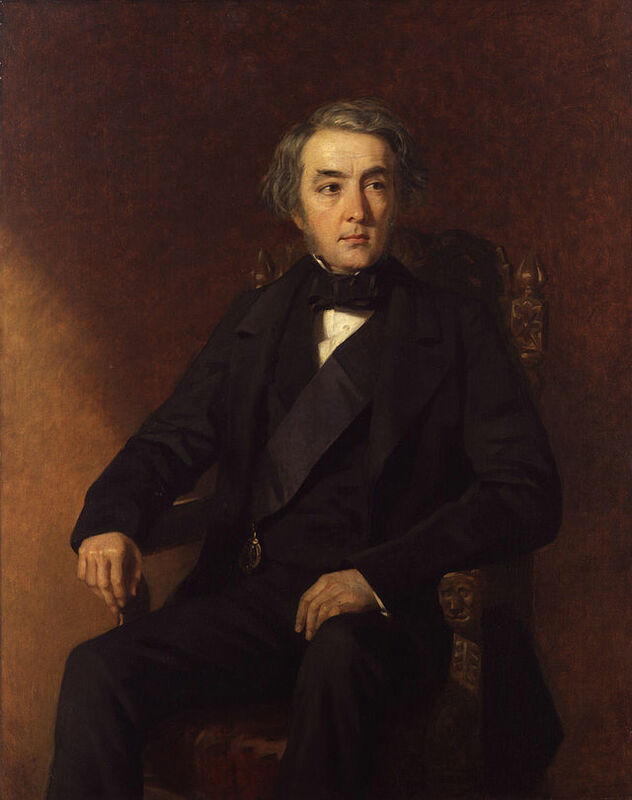 The recipe comes from the distinguished French Cook Louis Eustache Ude, chef to the Earl of Sefton. He came from good cooking stock himself, his father was chef to King Louis XVI. Ude was quite a character, there’s a great story of him being hauled in front of a magistrate after he had been found selling roast grouse on his menu before the 12th of August (the date from which the gamed season begins. See here for a post all about that). He was given a fine and sent on his way. The next day, the Scottish Laird who had reported Ude to the police returned to Ude’s restaurant to make sure he was abiding by the rules. Pleased to see there wasn’t a morsel of the offending bird on the menu, he ordered Salami de fruit défendu, i.e. Salmi of Forbidden Fruit, which turned out – of course – to be grouse! There was none of this nonsense when he worked for ,and was handsomely paid by, the Earl of Sefton, except when he left his service because Ude spotted the Earl’s son adding salt to some soup he made. Offended by this, he turned on his heel and left. This recipe is in essence a savoury custard, and may sound odd, but it is in fact subtle, delicious and light. It could only work with a home-made stock though. I imagine it would be excellent nourishing food for someone that is ill. The little custards can be served in their ramekins or turned out onto a plate. The recipe below comes from Jane Grigson’s English Food, where she suggests serving it with thin dry toast. A very good idea, I can confirm. It makes between six and ten portions depending on the size of your ramekins. 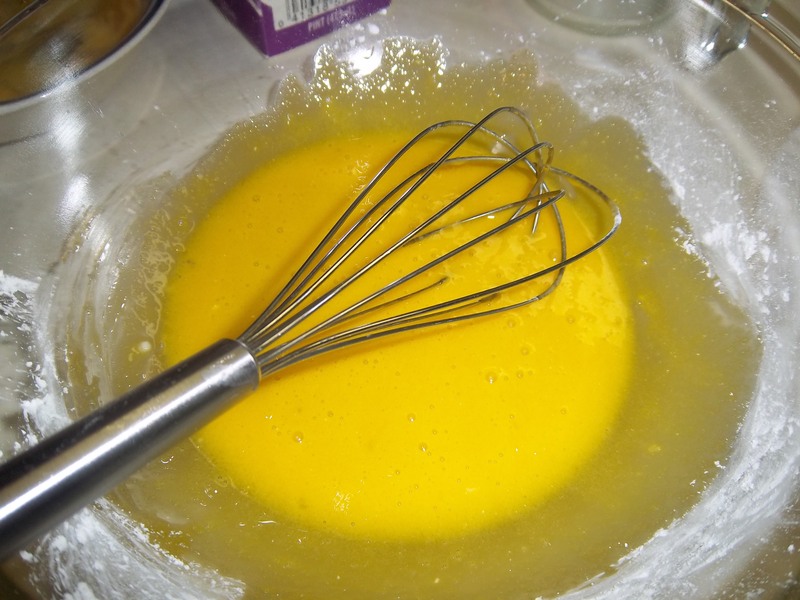 Bring the stock to a boil and whisk into the eggs as you would with a regular custard. Add the lemon zest and mace and season with the salt and Cayenne pepper and whisk in the butter. Place your ramekins in a deep roasting tin and pour the custard into them and cover them with foil. Pour boiling water into the tin, technically turning it into a ban Marie. Carefully slide the tin into an oven already preheated to 180⁰C and bake for 12 to 20 minutes, or until the custards are just set and still have a good wobble on them. Serve straight away. With today’s farming techniques it is hard to believe that eggs were a seasonal food just like fruit and vegetables: the cold winter temperatures were not conducive to incubating developing chicks, nor was there enough food during those lean times to produce eggs in the first place. When most people think of pickled eggs, I am sure they picture those sat in huge jars full of dark brown malt vinegar like grotesque biological specimens at the back of the fish and chip shop next to the pickled onions. I remember having one as a teenager and it was so, so foul; the malt vinegar was so strong and acrid it took my breath away, and the yolk had disintegrated into a brown pulpy acid mush. God knows how long they had been pickling for. Needless to say, that incident put me off them. However, I have rediscovered them and they don’t have to be like the chip shop ones – they can be piquant, subtly spiced and certainly mellow enough to eat on their own or in salads. There is no need to pickle eggs these days of course, except for the love of pickles themselves. Below is my recipe that is based on a recipe by Mary Norwack that appears in Jane Grigson’s English Food. The harsh malt vinegar is gone, getting replaced with much milder cider or wine vinegar, and they are further improved by the addition of some spice. First of all you need your eggs – you can use any kind you want, large, small, bantam or tiny quail’s eggs. I got small hen’s eggs from Abbey Leys Organic Farm via lovely Manchester Veg People, who are sourcing some of my food for the stall. These eggs are truly free range and organic, delicious, and more importantly cheap! People today don’t want small eggs any more, but their loss is my gain as far as I’m concerned. This recipe should be enough to fill at least 2 litres (4 pints) of pickling jars. You can do one huge one or several small ones. First, select enough eggs that you think will fill snugly inside your jars. Put them in a pan with cold water and bring them to a boil. Simmer the eggs until hard-boiled; this means just 2 minutes for quail’s eggs up to 8 minutes for large hen’s eggs. Tip away the water and let the eggs drain and cool. 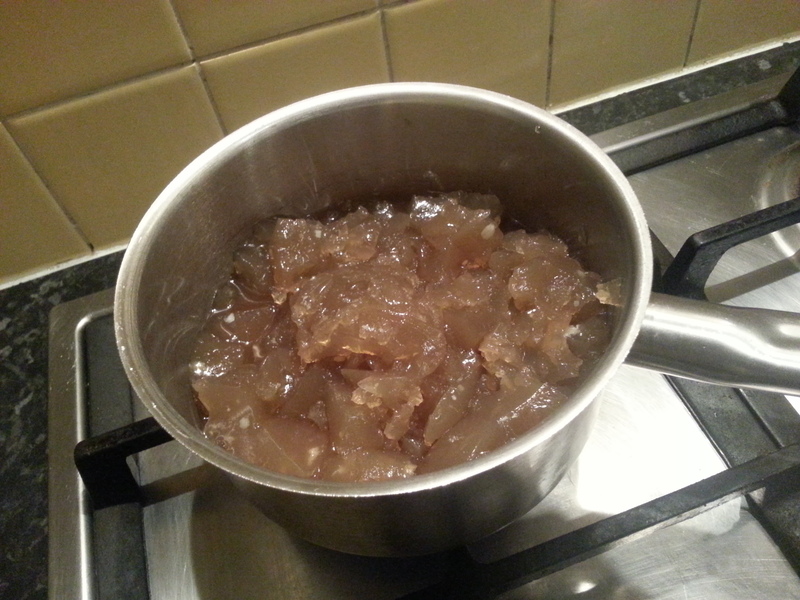 Meanwhile make the pickling liquor by pouring the vinegar into a saucepan. Add the spices and bring to a simmer for five minutes. Strain, then cover and let cool. Shell the eggs and rinse them under the tap and get to work squeezing them into sterilised jars. Then cover with the pickling liquor, making sure that the eggs are completely covered. Place a few of the spices in each of the jars and seal tightly. Leave the eggs for about 2 weeks in a cool, dark place and then enjoy! 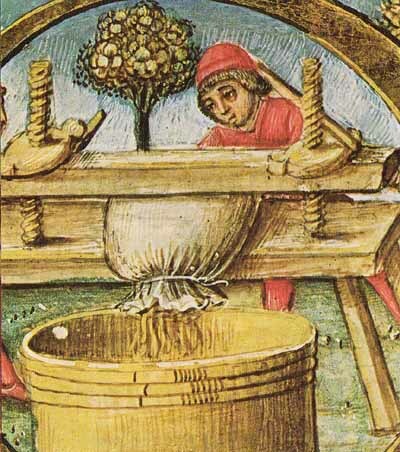 Verjuice was a very popular cooking ingredient from the Middle Ages onwards. Many old recipes ask for it and they seem to hit a peak during Tudor times. It is essentially the juice of either sour grapes or crab apples; Britain might not be the best place to grow delicious sweet grapes, but we can certainly excel in growing sour fruit! It took the place of fresh lemon juice in recipes for salad dressings, desserts like syllabubs; it was added to stews, soups and sauces as a seasoning, as well as an ingredient in marinades. It was also believed to have medicinal properties; for example, it was mixed with olive oil and blown up horses’ noses to treat colds! 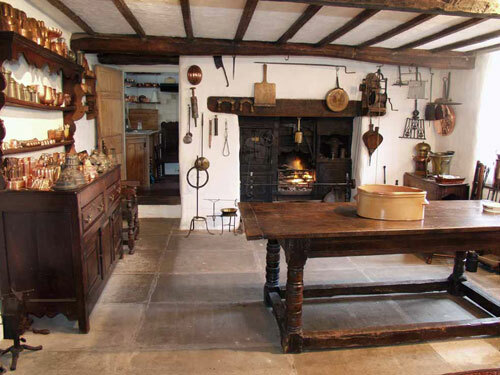 It was basically a necessary piece of kit in any kitchen, seeming to drop out of favour by the end of eighteenth century when lemons became more accessible. The word verjuice comes from the Old French verjus, with ver- meaning green or unripe and –jus being juice. The earliest written mention of it in British literature comes from around 1302, so we are talking old. It must have been such a useful ingredient in a place where fresh lemons will have either have been impossible to get hold of or terribly expensive. 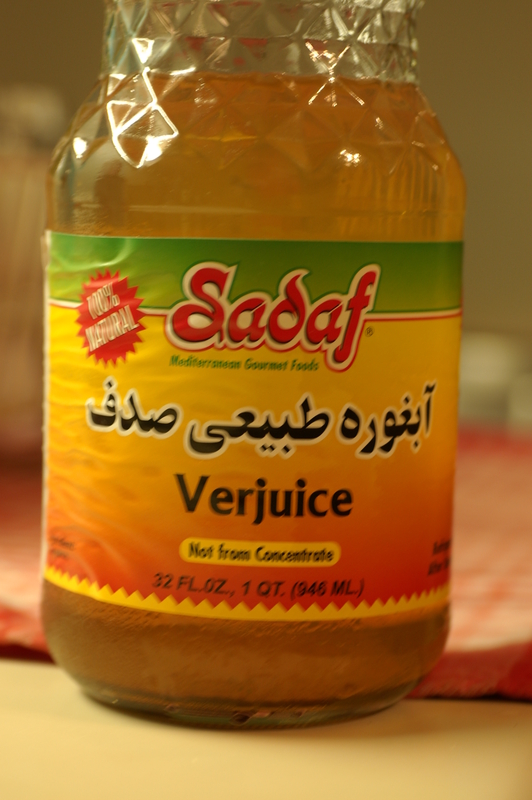 I expected never to taste verjuice, but then as I was wandering around the excellent Global Foods Market in St Louis minding my own business, I happened upon a jar of it in the Middle East aisle of the shop. Naturally I bought some and thought I’d try some original recipes where verjuice was a main ingredient rather than just a seasoning. In the 1897 volume of Good Housekeeping the subject of using verjuice in salad dressings inexplicably crops up. It takes quotes from the 17th century cook book The English Huswife by Gervase Markham. Anyway, it says that if you want to make a simple sallet then make a dressing of verjuice, sallet [olive] oil and sugar. Use it with sparagus, camphire, cucumbers, leeks, blanched carrots, purslane, with a world of others too tedious to nominate. He must have been in a bit of a mood the day he wrote that part. It was a pretty brief recipe. Although verjuice is very tart, its underlying flavours are rather subtle so it needed quite a high ratio of verjuice to oil (much more than vinegar or lemon juice dressings). I mixed together 4 tablespoons each of verjuice and extra virgin olive oil. To offset the sourness, I added a teaspoon of soft dark brown sugar, stirring until it dissolved. Lastly I seasoned it with a little salt and pepper. Easy and surprisingly subtle. Any leftover dressing can be stored and blown up your horse’s nose should it ever get a sniffle. Break four eggs, beat them, adjust with salt and four spoonsful of verjus, put the mix on the fire, and stir gently with a silver spoon just until the eggs thicken enough, and then take them off the fire and stir them a bit more as they thicken. One can make scrambles eggs in the same way with lemon or orange juice. It is of Mr McGee’s opinion that a sweetened version of this recipe could be the origin of the fruit curd. Notice that fresh lemons or oranges can be used, suggesting that they are less common than verjuice. Melt the butter in a saucepan on a medium heat. Whisk together the eggs, verjuice, salt and sugar until there is no trace of white left. Pour the egg mixture in the saucepan and carry on whisking over a medium heat. Meanwhile toast the slices of brioche. 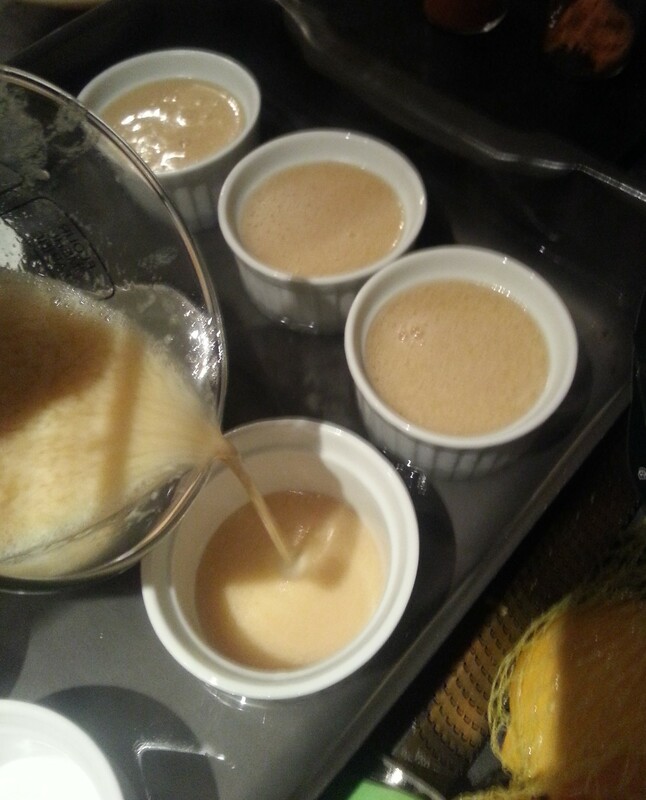 When the eggs have thickened and are just about to boil, pour them into two small pots and serve with the brioche. Where to start with eggs? They are so integral to our life because of their versatility. Whole eggs can be boiled, fried, poached, coddled, scrambled and baked. Used as an ingredient in pastry, in sauces and soups, they enrich and they bind, then if you separate the white from the yolk, you can make amazing meringues, velouté sauces, mayonnaise, hollandaise sauce, sauce Béarnaise and – my personal favourite – custard (please don’t call it crème anglaise!). 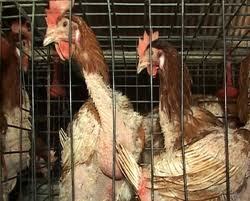 Twenty-six million eggs are produced per day in the UK. It beggars belief, it does. Well I think I shall start with the age-old philosophical question: ‘What came first? The chicken or the egg?’ Just as Maguelonne Toussaint-Samat does her amazing book A History of Food. She very interestingly points out that from a culinary point of view it is the egg that came first because chickens were introduced into Europe in the 5th century BC after the Greeks and Italians had been eating the eggs of other birds like geese, ducks and guinea fowl. Okay, I shall reword our question: ‘What came first, the fowl or the egg?’ Well, from a culinary perspective, the answer is the fowl. Eating eggs was a bit of a no-no because if one ate an egg, you were – in effect – eating a whole chicken, which is a huge waste. Due to this fact, superstitions naturally arose and still exist today. For example, the people of present-day Burkina Faso believe that children that eat eggs become thieves, plus there is a French saying on a similar vein: ‘He who steals an egg will steal a horse’. Eggs as food only really took off when chicken farming became common. It unfortunately took off in such a way that the poor old chickens – on the whole – have a miserably terrible time in their battery cages. That said I think there is legislation going through that says that all chickens should get some time to stretch their legs. In the 1970s and 80s, our eggs were in a right old state – there was intense over-crowding and the chickens were fed a meal made from the carcasses of dead birds. Quality of life, and egg, was very low, and because of the sheer number of chickens in one place, it didn’t take long for disease to spread. In this case it was the bacterium Salmonella enteriditis (SE) that killed many chickens and quite a few humans too. Coupling this disease with the fact that eggs from different ‘farms’ were being mixed up together, the source of the disease couldn’t be found readily. 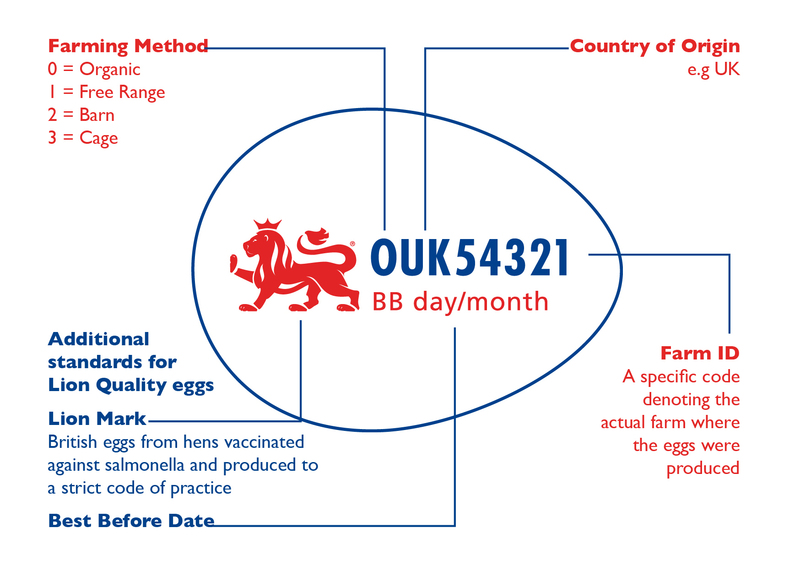 All this was addressed by the British government in the 1990s – chickens are now vaccinated against SE and with the introduction of the Lion Quality code that allows each individual egg to be easily traced back to its place of origin, so if there is an outbreak it can be tackled swiftly. Only one percent of eggs get contaminated nowadays, and even then there number of bacterial cells averages out at around 10 per egg – you’d have to be pretty unlucky to become ill these days. I personally, only go for free range; I feel far too guilty about the conditions they have to endure and I can’t bring myself to buy battery. The best eggs are those you can get from farmers’ markets, and are usually pretty cheap too. The good thing about modern farming methods is that we get fresh eggs all year round. Normally chickens stop laying during wintertime and therefore eggs had to be preserved, usually by pickling, in Britain. I quite like a pickled egg now and again. I often think how we’d cope as a nation if we suddenly had to eat our food seasonally. I reckon it’d be character-building. Eggs were off limits during Lent because they are from animals. No wonder they are so prominent during Eastertime. 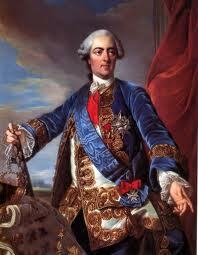 Louis XV of France loved boiled eggs and had them every Sunday for breakfast. He was so deft at eating them that the Parisian people would come and watch their king’s skills at work. 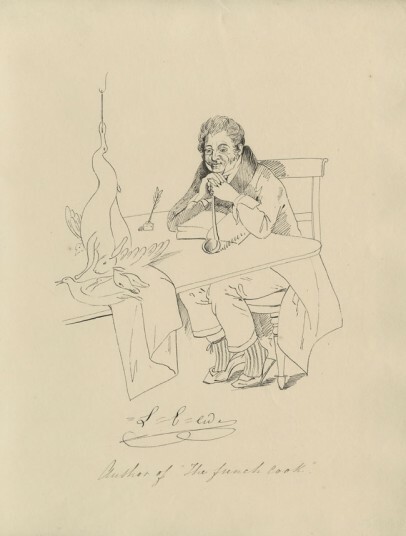 A crowd would gather, then a high-ranking servant would shout: ‘The King is about to eat his egg!’, and everyone would watch agog as King Louis sliced the top of the egg with one swift stroke of his fork. It’s amazing what passed as entertainment, though I have to admit it’s quite a skill. There is only one egg dish that ranks highly when it comes to gastronomy though and that is the omelette. Don’t be deceived by the French name; it cannot be claimed by them. During the Middle Ages, the English would tuck into cheese omelettes pretty regularly, though in those days we used the word fraysse. 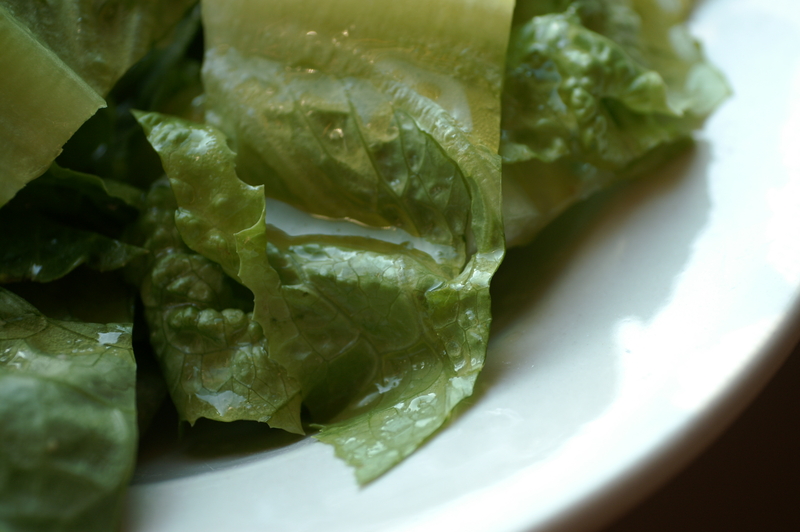 Like much Franco-Angle foods, the exact origins are lost in time. 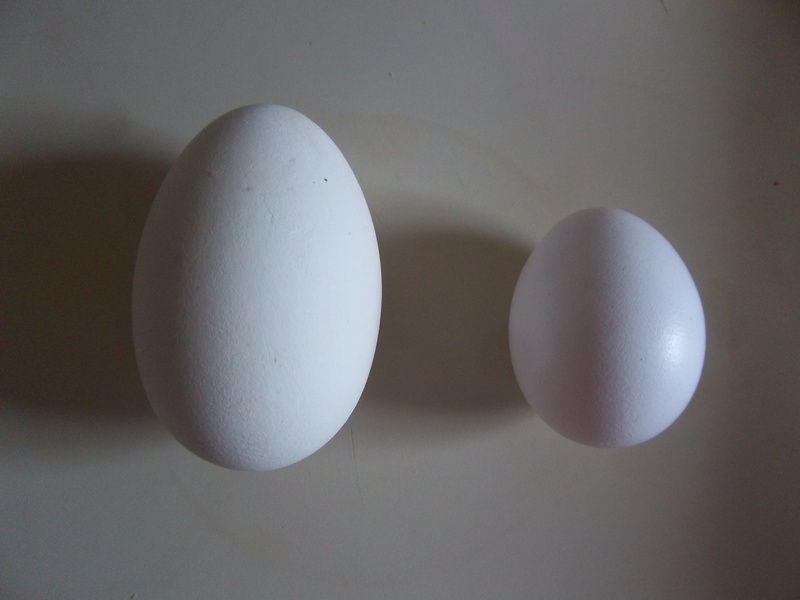 One final mention about hen’s eggs from a culinary perspective – they are a lot bigger than they used to be. Any recipe older than, say, around 1900, need a little modification and you might be best using two-thirds of the number stated. Quail eggs – these are probably the most common after the chicken egg, though were a novelty in the 1970s. I don’t really use them and don’t see the point of putting tiny fried eggs on food just for the sake of being fancy, I’d rather have a nice real farm chicken egg. However, they do make great pickled eggs. Duck eggs – these crop up more commonly these days, particularly in Chinese supermarkets. Apparently, ducks will lay their eggs anywhere, so to be safe a duck egg should be hard-boiled. 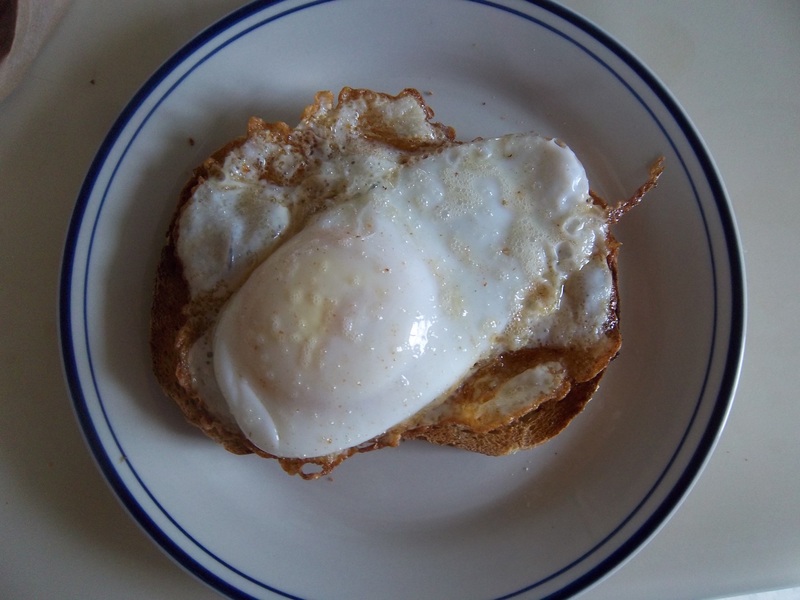 Goose eggs – I had never eaten a goose egg until recently when I spotted some for sale at Soulard Market in St Louis. They are massive. Naturally I snapped one up and ate is just like Jane Grigson said to: ‘fried in a little butter’. A ‘rare rich treat’ indeed. I can heartily recommend trying one. Gull eggs – the only egg on the list I have not tried. In fact I have never seen them before anywhere. Ever. I wonder if they are still available. If you know anything about getting hold of some, let me know. By proper custard I mean the pourable kind that goes on your pie, crumble or steam pudding. It also assumes the name cream custard and, of course, crème anglaise; you see it given that name in restaurants that trying to look all ‘high-end’, I suppose in many people’s minds, custard comes out of a packet or tin whilst crème anglaise is the real deal. Custard in Britain has become somewhat of a travesty over the last few decades and I wonder how many people have actually ever eaten the proper stuff, whatever name you like to call it. I think it appears extravagant, fattening or difficult to make. Well it might be guilty on the first two counts against it because of the egg yolks and cream that are used, but it’s not really that difficult. All it needs is a watchful eye and a little stirring. There ways of making it easier to conjure up, as well as reducing its calorie count and cost, and there is no need to always resort going to the packet or tin. Now, before you label me a custard snob, I need to point something out: I actually love custard made with custard powder and there’s really nothing wrong with it per se, but until you make the real stuff you won’t see they are almost incomparable. That said, there has been many an evening when I have a made a whole pint of Bird’s custard and eaten the whole lot to myself, but if there are people coming round for food, I always get the vanilla and egg yolks out. 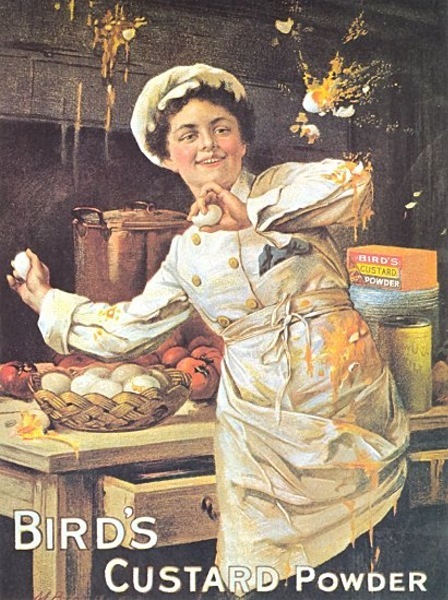 Bird’s custard was my first contact so it will always have a special place in both my heart and stomach. 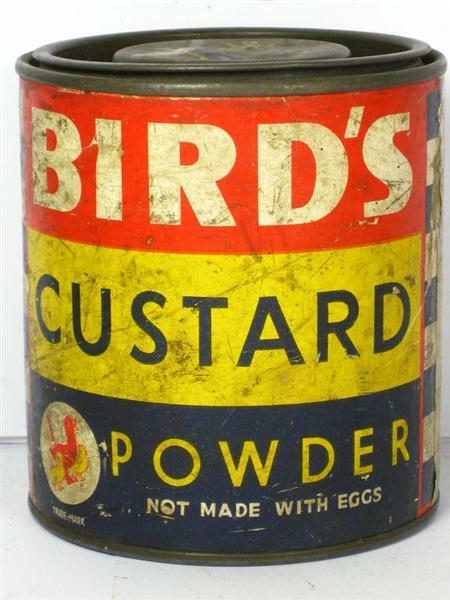 However, technically, Bird’s custard isn’t custard at all, for it contains no egg (see the main post on custard). 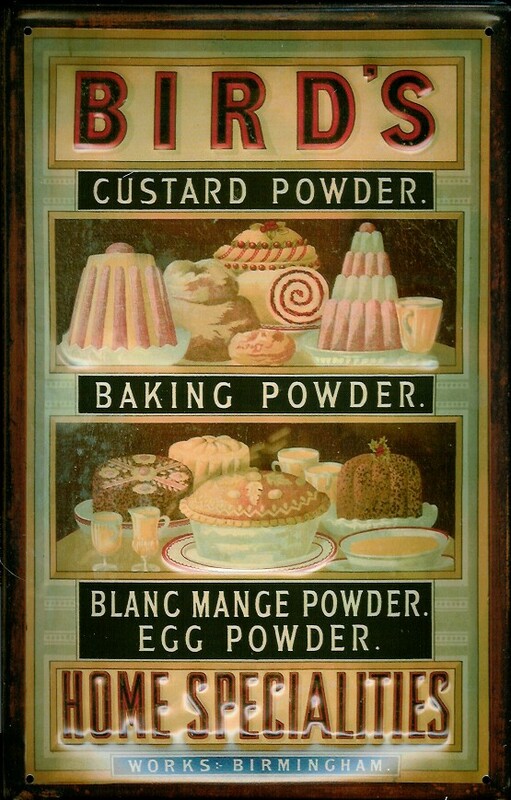 The powder was invented by Alfred Bird in 1837 because his wife, though she liked custard, was terribly allergic to eggs. Bird’s custard powder is simply cornflour with some vanilla flavouring and colouring. The famous three birds logo wasn’t introduced until the 1920s, surprisingly. Tinned custard is pretty good too and, up until the last five or so years, it was the form I bought custard in if I wanted proper custard. My tinned custard of choice? Ambrosia Devon Custard of course – nothing else would do – and, like the Bird’s, I still love it. 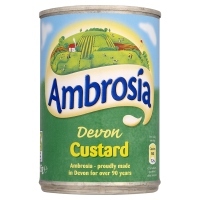 Again, however, Ambrosia custard does not contain eggs or egg products so is not proper custard. Now you can go off and buy the proper stuff in the refrigerator section of your local supermarket, always called crème anglaise of course, but you may as well make your own if you’re going to do that. Next time you make a trifle or a nice warm pudding, why not try making the real thing – England’s only sauce as the French call it – proper custard. It’s a recipe that goes far, far back and I gave an early recipe a few posts ago (see here). I hope to try some old recipes in the near future. These days vanilla is the typical flavouring, whether it be in the form of a pod, an extract or as vanilla sugar, but it is optional. Some like no spice or some go for an alternative like nutmeg or cinnamon. For me, vanilla is the only way. It is sweetened with sugar and the amount you add depends on your own taste, but as a rule I like sweet custard, especially when it’s with a tart fruit pie or crumble or with a stodgy suet pudding. I add less sugar if the dessert is very sweet, like treacle tart or sticky toffee pudding. 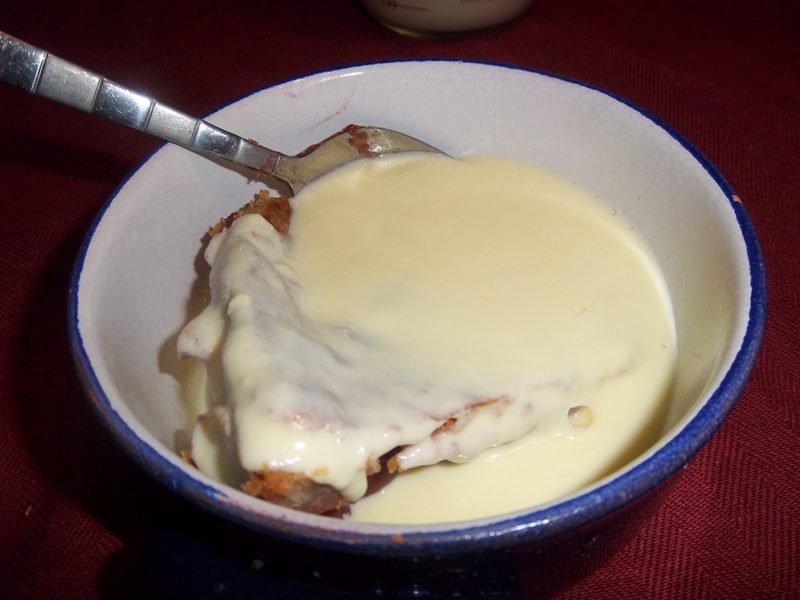 When it comes to thickening the custard, you need to be careful not to over-cook it as it results in curdling. If you are new to custard making, the best thing to do is to replace two yolks with two teaspoons of cornflour; it works as a thickener like the yolks, but it also stabilises everything, so you’re less likely to make an error. The recipe below uses six egg yolks, but if you want thicker custard add another, or another teaspoon of cornflour. Split the vanilla pod, if using, and scrape out the seeds and add to a saucepan along with the milk and cream. Bring slowly to almost boiling point. Meanwhile beat the egg yolks, cornflour and sugar together in a bowl. When the milk and cream are scalding hot and about to boil, pour it quickly onto the egg mixture whilst vigorously beating with a whisk. Tip the custard back into the saucepan and stir over a very low heat for a few minutes until it thickens and coats the back of your wooden spoon. On no account, let the custard boil, otherwise you will get scrambled egg. The temperature you are looking to achieve is 81⁰C (178⁰F). So if you are worried that it will curdle, either make sure you include the cornflour and/or put the custard in a bowl over a pan of simmering water. Don’t worry if there is a little curdling; simply pass it through a sieve and everyone will be none the wiser. I love custard. There is very little that can beat it in my opinion, especially during the winter months. By custard I mean the pouring kind also known as crème anglaise by the French and by people who want to sound posh. I call it proper custard. Custard is essentially eggs mixed with liquids, usually milk or cream, and then thickened using a low heat. The difficulty with custard is that they can be overcooked, you want the egg to thicken, but if you go too far the eggs either curdle or go rubbery. Custard should never be allowed to boil, the perfect temperature is around 80⁰C (180⁰F). If you want thicker custard, you need more eggs, not more heat. I started looking into custard and quite quickly realised that the term custard is actually quite diverse, falling into two broad churches, so thought I’d give a quick overview before I add recipes. First up are the cream custards, i.e. sauces that are made in a pan and stirred like the aforementioned crème anglaise that is poured on pies, crumbles and steam puddings and the like and is used cold in trifles. Egg yolks and cream or milk are used here, usually flavoured with vanilla and sometimes scented with orange flower water or rose water. Many people think that proper custard is made using custard powder, but they would be incorrect. Don’t get me wrong, I love a bowl of Bird’s, but it is not proper custard. In fact, it isn’t technically custard at all as it doesn’t contain any eggs. There is also confectioner’s custard, crème pâtissière, or pastry cream, thick and sweet and used to make delicious vanilla slices or profiteroles. This custard is unusual because it is heated until it boils, stabilised with cornflour. Also in this category are the fruit curds that are used in tarts, puddings or just in sandwiches. Here, the liquid is provided by fruit juice, typically lemon, but orange, lime and passion fruit curds are made too. Much more common are the set custards which are baked and usually protected from the dry heat of the oven with a water bath. Whole eggs are used, because the whites form a matrix of albumen creating a gel, setting the custard. The more egg white included, the firmer the custard; useful if you want to turn it out onto a dish. Set custards are a diverse group. There is the classic baked custard, possibly my favourite ever dessert, but also lemon or orange tarts which are similar to fruit curds. All of these can actually be served with or without a pastry crust. Custards cooked in this way were also called douchets. Those without crusts include such classics as bread and butter pudding, burnt cream (or, if you like, crème brûlée) and crème caramel. Then there are the custards that you don’t think of as custards, like baked cheesecakes or savoury quiches. 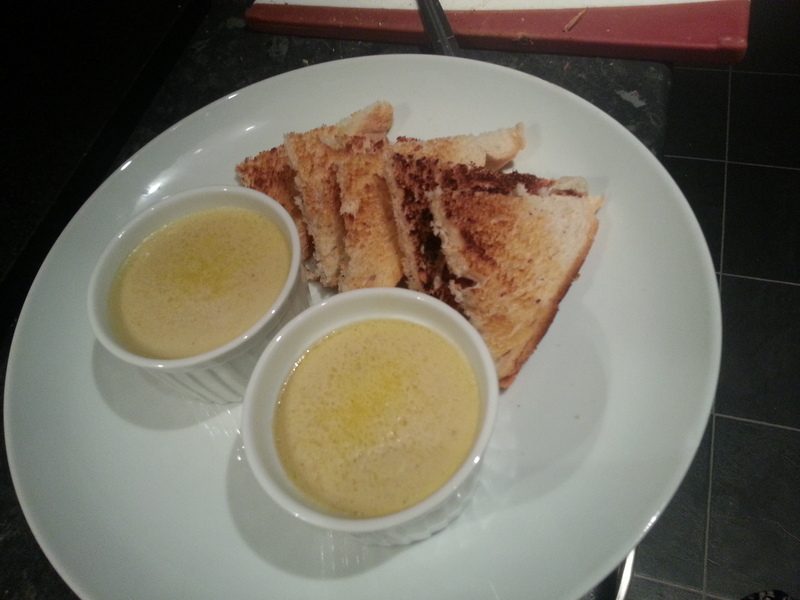 There are set savoury custards made with meat stock that were once a popular starter, served warm with crisp Melba toast. I have also found recipes for cheese custard and potato custard. Break your eggs into a bowl, and put your cream into another bowl. Strain your eggs into the cream. Put in saffron, cloves and mace, and a little cinnamon and ginger, and, if you will, some sugar and butter. Season it with salt. Melt your butter and stir it with a ladle a good while. Dub your custard with dates or currants. I have to say, it sounds delicious. I shall cook it someday. By the seventeenth century onwards, set custards had become popular. This is because they were actually more difficult to make than the saucy ones. This is because it was rather problematic to effectively use water baths, plus it was difficult to check the ‘doneness’ of the custards with the old open fires. 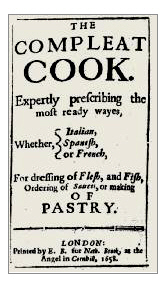 As ovens became more refined, this sort of delicate baking was easier to attain so up popped puddings like burnt cream (crème brûlée), though the country of origin is somewhat disputed, though the earliest I have come across is from 1692 and is French. Elizabeth Raffald was the Queen of Custard, her 1769 book The Experienced English Housekeeper contained no less than 13 custard recipes both creamy and set, sweet and savoury. I am definitely going to try some of hers, but here’s one that I can’t see getting round to doing as it uses beest, which is an old term for a cow’s first milk produced after calving. Take a pint of beest, set it over the fire with a little cinnamon or three bay leaves, let it be boiling hot. Then take it off and have ready mixed one spoonful of flour and a spoonful of thick cream, pour your hot beest upon it by degrees. Mix it exceedingly well together and sweeten it to your taste. You may either put it in crusts or cups or bake it. What is interesting is that it bay leaves are used; it’s half way between a custard and a white sauce. I wonder of the beest tastes extra sweet as well as extra rich.